The West of England has elected its first metro mayor, Tim Bowles in May 2017. He has control over the whole West of England combined authority area, working with existing city leaders to take forward his strategic plan. You can find out more about the new metro mayors and how they work on our FAQ page. This page brings together the key facts and figures about the West of England economy. West of England consists of the following local authorities: Bristol, Bath & North East Somerset and South Gloucestershire. Understanding how the city-region performs on key areas such as productivity and employment helps the metro mayor to assess what he should prioritise. The table below shows how West of England compares to the national average on these indicators. 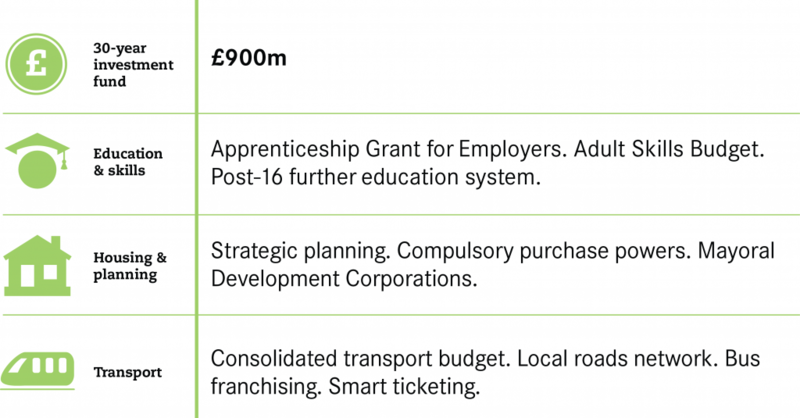 What are the policy priorities for the West of England metro mayor? We outlined a set of priorities that the West of England metro mayor should focus on in his first term. Read them in full, or read more below. Review the strategic decisions on rail extensions bringing together decision makers in City Hall. What powers does the West of England metro mayor have? Below is a summary of the powers the new West of England metro mayor has, based on the devolution deal agreed with the government.